The bus from Ho Chi Minh City (Saigon), Vietnam to Phnom Penh, Cambodia is usually straightforward. We spent US$15 for it. The six-hour land trip is a very common route. And you can easily buy tickets anywhere in Vietnam. But for this trip, we encountered some problems. We left Mui Ne at 1 a.m. for the five-hour trip to HCMC. We were to catch the 8 a.m. bus to PP hoping to be there by 2 p.m. I had always wanted to shop again at the Russian Market since they have a lot of great cultural souvenirs and export overruns there. What I thought would be an easy border crossing turned out to be an irritating one. At the Vietnamese border, the immigration officer treated us shabbily. We were standing in front of him for almost 30 minutes and he was not minding us. At times, he was smirking. When asked if we were in the right line, he would answer "I'm busy" while passports of the people behind us were brought to him. We didn't budge until finally he entertained us after we reminded him that we could be left behind by the bus. At the Cambodian border, we had to wait over an hour for our passports to get processed. But the highlight of the day was the four hour wait for the bus to get on the Neak Leoung Ferry that would transport it across the Mekong since there was no bridge yet. 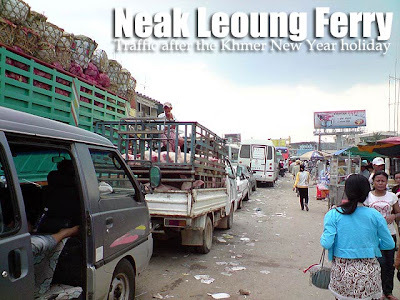 Since the Cambodian New Year holiday had just ended, everyone was rushing to get back to Phnom Penh which explains the traffic jam. We finally arrived in Phnom Penh, close to 5 hours behind schedule. But it's all part of the adventure. For more information on what to do in Ho Chi Minh City, read Things to do in Ho Chi Minh City (Saigon). Three days is not enough if you want to go to Phnom Penh. To enjoy PP, you'll need an extra 3 days, one day to get there, another day to explore, and the third day to get back to HCMC. So just enjoy HCMC. 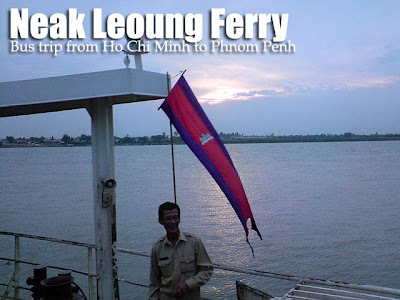 You can opt for the Mekong River tours and others available in HCMC. Hi Ivan! Awesome blog! I'm really interested in your trip around Cambodia, Laos and Vietnam, because my friends and I are planning to take a 2-week trip this summer to those three countries. We've been doing a lot of research already, but I wanted to get a Pinoy's perspective as well. I sent you an email about it - hope you can give us some good advice! Hi Ivan ( my colleague in Collegian way back then)! Kumusta? I'm going back to HCMC this August and I'm planning to check out PP (since I've never been there). Then, I'll go back to HCMC. I have 3 extra days before flying back home to Manila kasi. Where do you suggest I stay? You see, I'm going there by myself. Is it safe? My friends and I are leaving for HCMC this week and part of our itinerary is to go to Siem Reap Cambodia to see Angkor Wat. I've heard it's a 6hr bus ride to Pnohm Penh and another 6 hrs to get to Siem Reap - looong trip! I'm just concerned with bringing gadgets for this trip, such as laptop, etc? Do you think it's safe? I'm just scared that we will be mugged or something. I and my colleague will be in Vietnam on Feb 22nd, and will go to Cambodia then. I will be presenting a paper on an int'l conference on the 25th and 26th. Now, if you may, can give us practical ways and tips on how to get to Phnom Penh, Cambodia? I hope for your reply. Just take a bus from Pham Ngu Lao in Ho Chi Minh City. My experience is an exception to the rule, I hope! hi ivan! we're planning to go to HCMC in April. Don't have a place to stay yet. Don't know the places to go to either in HCMC. Any suggestions? Any precautions? Do we need a visa to go there? Can I bring cigarettes? How many? Would you recommend a restaurant? Thanks! I'm not sure about customs regulations on cigarettes. No need for visa for Philippine passport holders. hi ivan! kindly help me! You will have to do HCMC-Phnom Penh-Siem Reap-Bangkok. You will need a minimum of 3 days to do this trip. 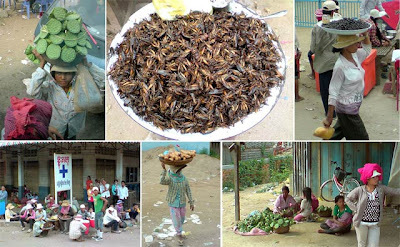 ivan, what is the best food of vietnam that foreigners should not miss out? what is it made of..
we are going to BKK this may 2012 via Ho Chi Minh, is it okay to travel from Ho Chi Minh to Cambodia in the evening then Cambodia (next evening) to BKK? my friend said that we cannot travel in the evening, is it true? where in Cambodia can we go so we can travel in the evening to BKK. thanks a lot! I don't think you can travel in the evening. You can check but I would think the border crossings are most probably closed. If you want to travel by bus from HCMC to Bangkok, you will have to allot three full days for travel, one for HCMC to Phnom Penh (6 to 8 hours), another for Phnom Penh to Siem Reap (6 hours), and finally Siem Reap to Bangkok (10 hours).